I’ve been making steak tartare for about six months now and my favorite recipe is below. A grinder makes it easy and pretty but it can also be sliced thinly with a sharp knife. The most recent serving (pictured) was for a holiday event and so delivered on toast points. But it’s hard to savor the beef and especially the egg that way so consider arranging the toast points to the side or even omitting them. The tartare and egg can then be mixed to taste and spread if desired. Remove beef from refrigeration, leave covered. Prepare other ingredients in bowl. Grind or cut beef, add to bowl, fold together gently. Form into disks with a center depression for egg yolks. Here are the tribulations of the likely certainly too-ambitious process of making a Chicken / Duck / Cornish Game Hen recursively stuffed bird. Why? A TurDuckEn is great but also huge. This should be more suited for a smaller group. Also any excuse to enjoy a game hen is a good one. There is a good resource for de-boning a bird here. I followed it for the most part but made the cardinal sin of tearing and puncturing the skin slightly which risks losing juices during the cooking. I think next time I’ll be less focused on rolling the bird inside out “like a sock.” I ended up making more surgical-like cuts internally to remove the bones from the meat and skin vs. trying to peel these back off the ribcage. Chicken is a bit ordinary so I’ll marinate this one in a tart cherry and cranberry sauce for 24 hours. Maybe we’ll get some holiday red to go along with the green center of rosemary, parsley, Basil, sourdough stuffing planned….. The problem was that I tried to cook it too quickly and this along with my error above tearing the skin caused the top to dry and split. While this may sound esoteric, we could really taste the difference in the moistness of the birds inside. It was edible but not nearly as good as the Turducken we bought for Thanksgiving. It cost about half as much to make it than to buy it but that is still about $40. Plus the prep is a pretty intense time commitment of about 4 hours. Lastly, I consider myself a carnivore to the end but the process of de-boning birds tested this. It is definitely not for the squeamish and had me considering a vegan sabbatical happy-place during the process. It will be a while before I try again. As you probably know, I’m an avid foodie, but I also have that pesky career which takes up quite a bit of my time. I’ll occasionally commit time to roasting peppers or experimenting with a dozen new ingredients to spice up my queso. There isn’t always time available though so shortcuts have a place in my kitchen and and this 3 ingredient queso is a nice example. This can be as simple as melting the cheese on the stove top, adding the chopped onion and jalapenos, and letting it simmer on low heat for 5 minutes. I recommend this vs. a microwave because the time in the saucepan will allow the flavor to blend. The jalepenos can be canned or fresh. You can add a bit of milk, water, or white wine to help thin the mixture to suit your taste. If you can commit a second 5 minutes as I did in the picture, saute the fresh jalapenos and onion in the pan with a tablespoon of olive oil first until the onions have browned. Then add the cheese. 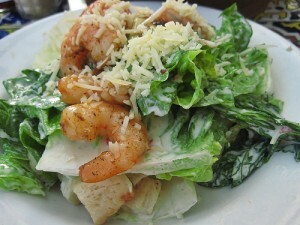 I made this egg-less caesar salad last night with grilled shrimp and romaine and enjoyed the dressing as much as the classic version. Plus, it’s easier and healthier. Original recipe from AllRecipes.com. Half-cook the bacon. Depending on how much bacon fat you’ve got, add 1 or 2 tablespoons olive oil. Add chickpeas, bell pepper, shallot, and garlic and saute until the chickpeas start browning, maybe 5 or 10 minutes. Add paprika and stir in spinach until it’s wilted, 2 minutes or so.